11' x 32' x 6"
There’s been some big changes in the Bote Inflatable Paddleboard line this year!! The beloved Bote Breeze has new upgrades, a sweet facelift and a completely new name!! Now being labeled the Bote Flood Inflatable or “Bote iFlood”, it’s based off the same great platform as last year but has some awesome improvements. Just like its predecessor the Flood Inflatable is an amazing all around board for casual paddling and exploring your local waterways. It’s got good stability, and predictable handling all in an inflatable package that can fit in most trunks. Not only are you getting the same great package as last year, Bote has also added to great features for the new Flood Inflatable! This year the 11’ package comes with a paddle sheath attachment and the tackle rack receiver plates!! This means that the new Flood can be used as an all-around inflatable SUP or can transform into your personal fishing platform. The paddle sheath is a plastic sleeve that your paddle can be stowed in while you take a break or to free your hands up to do something else. The receiver plates allow you to add Botes optional Tackle Rack Receivers to use with their Tackle Rack fishing post or the new Bucket Rack. Until this year both features were only available on Botes more expensive models so it’s an exciting upgrade for sure! Travelink Sling Compatible: Like last year you have attachment points on the left and right side of the board for Botes Travelink easy carry strap. This makes carrying your board much easier when the path gets long. Constuction: Bote constructs their Aero Flood with military grade PVC, using a drops stitch core and heat welded seams. This makes their inflatables tough and extremely rigid when fully inflated. 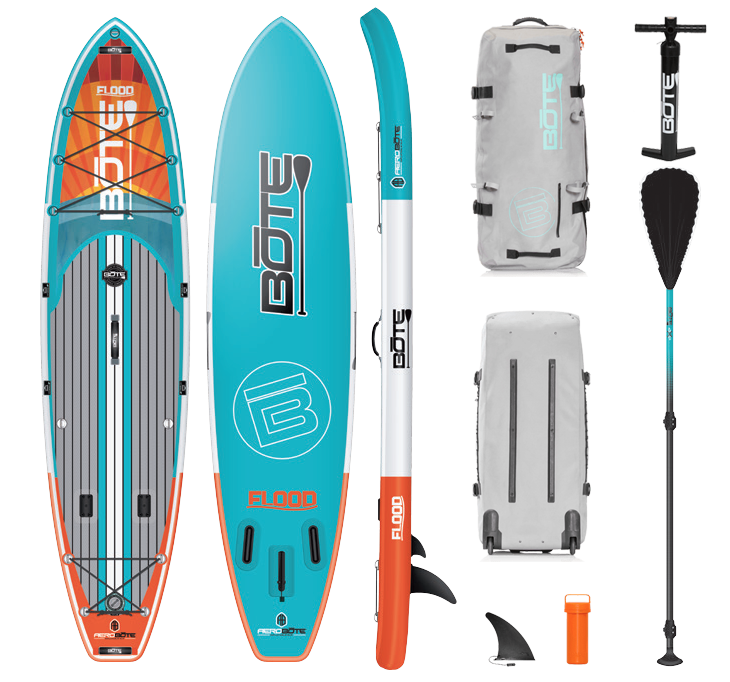 Included Accessories: This year you get the improved fiberglass shaft, molded blade paddle, paddle sheath attachment, repair kit, and travel bag. The adjustable paddle is not your cheap aluminum paddle that comes with a lot of packages. It’s comfortable to paddle and feels efficient. This year the bag has been improved too, it’s a much nicer bag than last years model. Overall this year’s Flood inflatable package is a proven shape that will put a smile on your face and save some people a little money with all the extra additions. If you have any questions about the Flood Inflatable or how it compares to the rest of the Bote Aero line of SUPs feel free to give us a call or use our contact form by Clicking Here.